I don’t usually review middle grade non-fiction, but this book is so lovely I couldn’t resist! Such a perfect book for the Year of the Bird in 2018 (see more about the Year of the Bird). Even though it's now 2019, I love birds and I think every year should be the year of the bird! This book seems to have everything anyone could want – gorgeous photographs, cool bird facts, information about state birds and extinct birds, legends and stories about birds, lovely poetry – and even some information about dinosaurs! I really enjoy picking up this book when I have a quiet moment. It’s fun to discover something new or read a bird-related poem before I gaze out the window at my bird feeder. I’m going to have to track down some of the movies in the “birds on screen” list. You might like to spend some time studying the lovely poetry in this book. It reminded me of how nature and science can inspire our writing work. 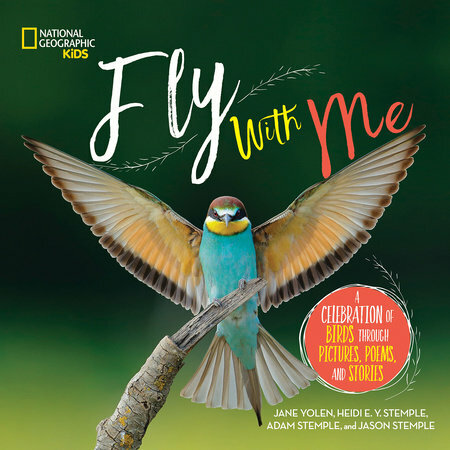 This book is a great resource for students who are learning about or interested in birds. It’s packed with information so some kids may be overwhelmed if they think they have to read it all. A book that is well-suited to flipping though and finding things that catch the eye. It would be lovely to have on hand to go with a bird feeding station or in a quiet area for students to sample from when they have a free moment. To see birds, you need only to open your eyes and look. For more resources about the Year of the Bird at National Geographic’s Kids site. Lovely post, Andrea. I had no idea 2018 was the year of the bird! But then again, I was hospitalized for a good part of it and then recuperating at home and avoiding social media (and my own blog). This looks like a gorgeous book. This book sounds like it has everything you could want in a nonfiction book! Thanks so much for the recommendation! The cover alone makes me want to read this one. NGK always has stunning pictures to accompany the learning you absorb on the pages. Thanks for sharing this unique title. It really is lovely! There are also pages on state birds which would be a great connection for educators. Such a beautiful cover. Your lovely review makes me want to check it out. I have noticed more PBs and MG novels with birding themes woven into the stories in recent years. Hope it is a sign of kids interest in nature. I've noticed that too, Patricia. I really hope more kids are becoming interested in nature. This is a book I meant to get to when it came out, but forgot about it. Thanks for the reminder. I just ordered it from my library while I read your post.